Bout Of Books 15.0 – Wrap It Up! 1. Neverwhere by Neil Gaiman. (5/5) My new favorite Gaiman novel; a magical realism story mixed with urban fantasy and the right dose of humor. Simply brilliant! 2. Dead Wood by Dan Ames. (3,5/5) An entertaining enough read if you like a good crime story with some interesting music references. 3. Serafina And The Black Cloak by Robert Beatty. (4/5) Very good middle grade story that has a good mix of fantasy and scary elements and I really liked the prose. 4. All The Truth That’s In Me by Julie Berry. (4,5/5) I was more than pleasantly surprised by this historical fiction novel. Such an original, beautifully written and emotional story! 5. Confessions Of A Murder Suspect by James Patterson. (4/5) It’s the first time I read a Patterson YA novel, but I flew through the pages and it was a really entertaining read. 6. Fantastic Mr. Fox by Roald Dahl. (3,5/5) He is one of my favorite childhood authors and I always love rereading his work. This is not my favorite, but still good. 7. Never Always Sometimes by Adi Alsaid. (3/5) I can’t say I was impressed by this one. It wasn’t terrible but there were some parts that really bothered me. 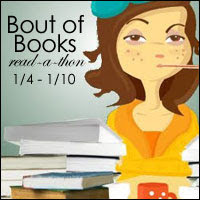 Confessions Of A Murder Suspect was such a fast read that I managed to read a lot of pages on day 5 of Bout Of Books 15.0. I picked up a copy of on Fantastic Mr. Fox as well on a whim, written by one of my favorite childhood authors Roald Dahl. I still can’t believe I haven’t read that one before! 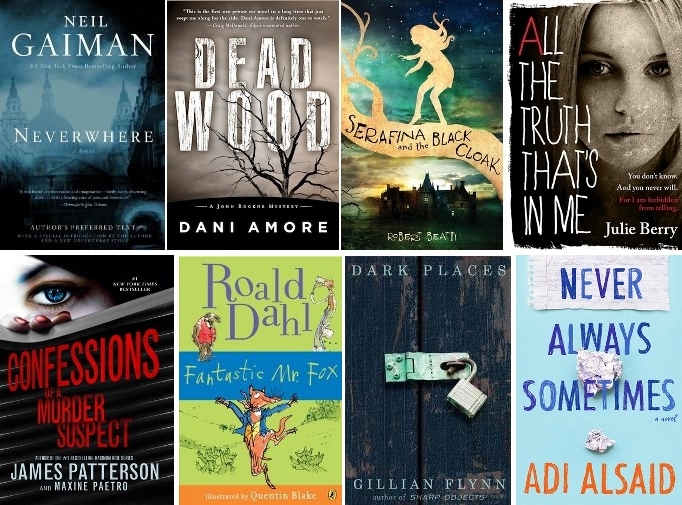 I don’t really like the characters of Dark Places, so I have been struggling with that one… And decided to pick up Never Always Sometimes and see today which of the two I want to finish first. I didn’t have a lot of time to read on day 4 of Bout Of Books 15.0 but I already read way more than I inicially thought anyway so I don’t mind that much. 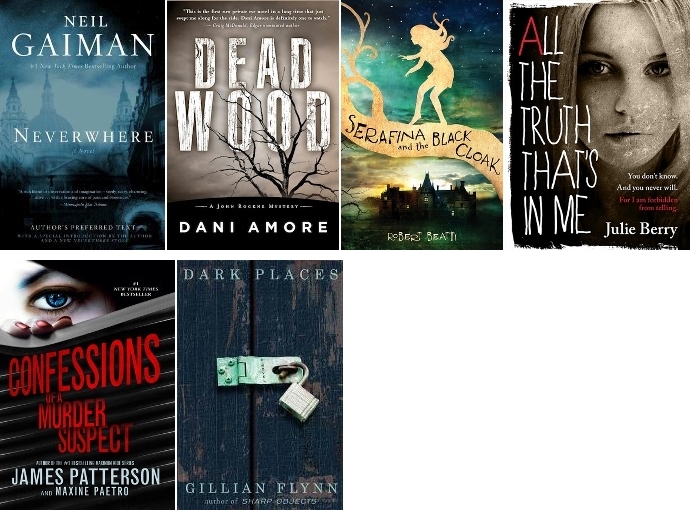 I started Dark Places the other day, but somehow I find it hard to get into the story… So I decided to keep my promise and pick up another crime novel: Confessions Of A Murder Suspect. So far it’s a really fast read! 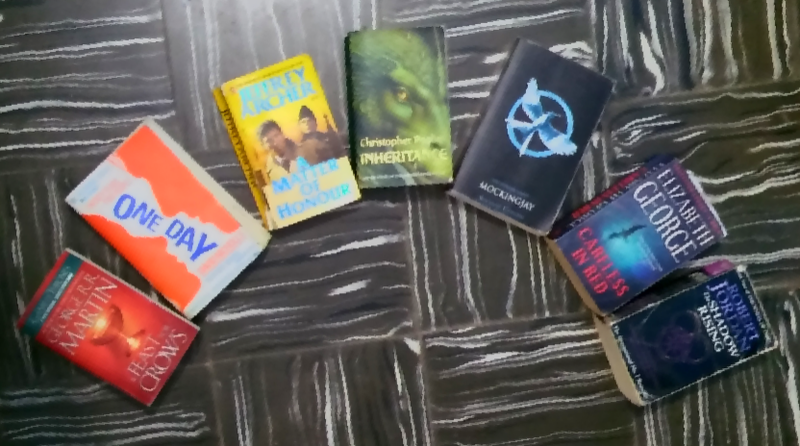 For the cover challenge, collect books from your bookshelf (physical or virtual) and make yourself a rainbow using the covers. A rainbow is ROYGBIV (red, orange, yellow, green, blue, indigo and violet). Then take a photo or arrange images of those books into a rainbow, and either post to twitter (@bookybecksa & #boutofbooks), post to your own blog and leave me a link in the comments below or simply comment below with your response! Bout Of Books 15.0 has officially started! I actually managed to read more than I thought yesterday because a rainy day is the perfect excuse to stay inside and read. 😉 I finished the last 20% of Neverwhere and started two new reads as well… Hopefully I will be able to finish those by the end of day 2! Writing My Own Fairy Tale is hosting today’s challenge: answering the five ‘would you rather’ questions below. Lend books to someone who dog-ears pages or to someone who reads with cheesy Cheetos fingers? Be able to meet one character of your choice or meet one author of your choice? Tough one! Because if you ask me, it would be impossible to pick just one character OR author… But I think I’ll stick with the character because it would be awesome to meet someone fictional. Never be allowed in a book store again or never be allowed in a library again? Another toughy! Not being able to enter a book store again would break my heart, but I could never go without a library. Have to choose one of your favorite characters to die in their book or have to pick one of your favorite couples to break up in their book? Mmm, I would rather have a couple breaking up than one of my favorite characters dying… Death is just so final. Be required to read Twilight once a year for the rest of your life or The Scarlet Letter once a year for the rest of your life? Can’t say I’ve read The Scarlet Letter and I still regret having read Twilight, so I think I will go with The Scarlet Letter just so I can at least read something ‘new’ one year.